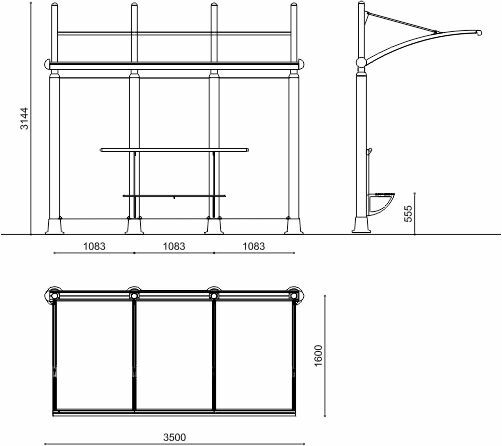 Shelter constructed from special profile extruded aluminium bearing columns with thin vertical stripes, with steel base plates, connected at the top by an extruded aluminium profile which acts as a gutter. 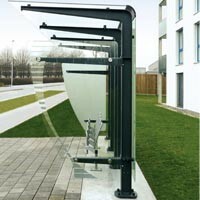 The cantilevered cover is in transparent or smoked methacrylate sheets, supported by a structure made from extruded aluminium support ribs and counter support ribs and stainless steel tension rods, fixed to each upper column insert, in tubular steel, with stainless steel cover. 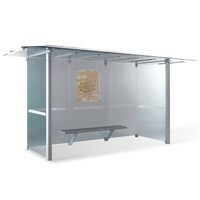 The walls are reinforced coupled safety glass or perforated steel sheet. 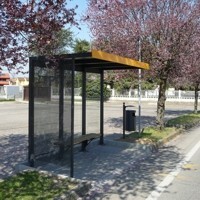 The shelter is provided with a tubular stainless steel handrail which is fixed to the rear columns. Ground fixing is through base plates with suitably sized steel ground anchors. 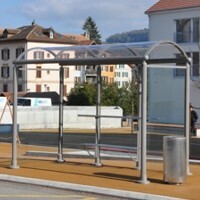 The shelter can be supplied complete with: side walls in glass or perforated steel sheet; steel bench; rear notice board; advertisement side wall; extruded aluminium front sign; lighting unit.